$400 Bitcoin - Strong Bull Rally Final Target 600s. May the #crystalball be with us. Ladies and gentlement, the FOMO is real. $BTCUSD price action has been picking up steam over the last weeks, with a year long accumulation prior to the rise which has broken $318 convincingly. Over the last week, we broke above $318 and made a high of $334.67 and consolidated for a moment before breaking above structure again, creating a new 2015 high of $342.06 on 2nd Nov. I went into greater detail on my Twitter post and Tradingview chart last night, saying that this move has legs and can potentially rally to $400 and beyond. Since then, we have rallied past the 340s and $BTCUSD (Bitstamp) is currently trading at yet another new 2015 high of $396. We're currently seeing the bulls and bears battle it out within the 386-396 zone. Edit: Bitcoin has now broken $400 and is trading at $406. As I mentioned in my previous blog post: "this marks the beginning of a new uptrend as we head into 2016, with news outlets ready to paint a bullish picture as the market requires new buyers to get into pump mode." I'm sure there's still plenty of news pieces in store, ready to be unleashed at appropriate times over mass media channels in the next months to attract new money into the bitcoin economy. Looking forward to next week's weekly candle and seeing this Triple EMA turn green. Everything has been looking good since re-entering bitcoin in August and with the crazy price action since breaking out of $240. Will have my sight set on $600+ if 420/450/480 levels are blown through. 657/670 will be my final targets for this run and I may be looking for a short into the 400s before loading up again. Trade safe, and may the power of the #crystalball be with us. I think we're gonna see the 2015 high broken a few more times, so remember, the trend is your friend. Get yourself in a favourable position during the bitcoin rally, and leverage this opportunity on OKCoin, BitMEX, or Bitfinex for margin trading up to 100x. On a separate note, the S&P 500 ($SPX) looks almost ready for a short entry. I've been eyeing this one for a while now. Watching the Triple EMA on the weekly closely. Capitalize on this with Bit4x, 1Broker, and SimpleFX, and trade in global capital markets stocks indices forex using bitcoins. Share your thoughts and questions in the comments section below, or send me a direct email by filling out the form at the bottom of the page. 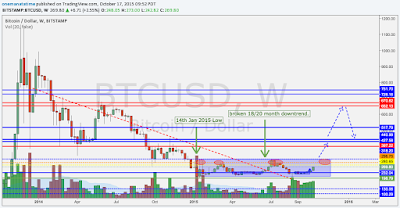 Bitcoin made a low on 14th January 2015, and has broken its 18 month downward trendline around June/July 2015. This marks the beginning of a new uptrend as we head into 2016, with news outlets ready to paint a bullish picture as the market requires new buyers to get into pump mode. 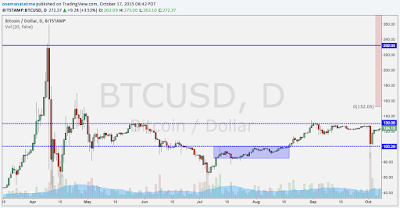 $BTCUSD began rallying up since breaking out of the 240-243 range on 6th October 2015, accompanied by a sustained large surge in volume since the last recent low of 25th August 2015. Accumulation has picked up pace since August 2015 and it looks like we're heading to retest $300 for the 4th time since the 2015 Low (Related: TradingView - 3rd time's the charm, right?). 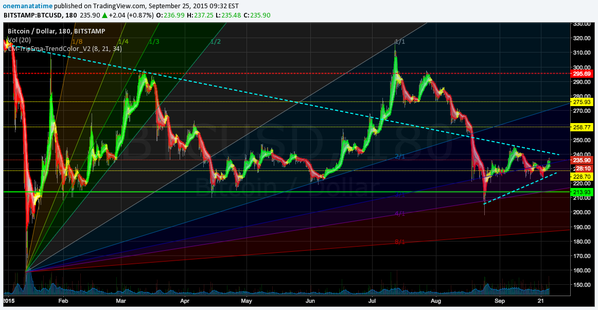 $BTCUSD currently trading at $270/273. On Oct 6 it traded between $240 and $243 for less than a day before breaking up with good volume. If this breaks 300/318 convincingly, we could see a run up to 400-450. 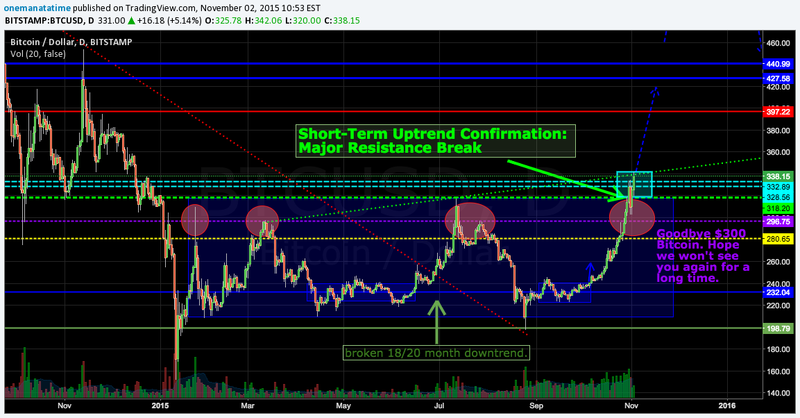 300 is a key level of resistance which will in future act as strong support if we trade above $300. See the chart in greater detail on my tradingview post here. 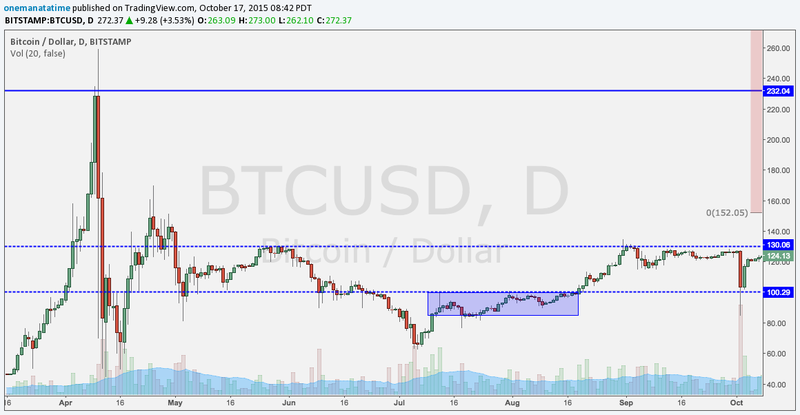 On the downside, if we head to break $200 and retest $160, bullish scenario may be invalidated or delayed. Who knows what 2016 could bring? Not too sure, but I'm sure people will call it the "pre-halving" pump (and dump) anyway. What do you think? Are we ready for what's coming? I'd love to hear what you think, so share your thoughts or questions in the comments section below! For more questions such as how to buy bitcoin or what's the best exchange to use, send me a direct email by using the contact form at the bottom of this page.